I have a "Gold Membership" at $90 a month it isn't cheap; non-member range fees are $30 an hour. With the Gold Membership it's free range time and free targets. I figure that with 3-4 visits per month I get my money out of it. What's especially nice is that in the dead of summer I have a nice air conditioned place to shoot - I don't mind paying for that luxury! Just this week I shot on Thursday, Friday, and yesterday. Here are a few of my targets; in some areas I need work but with a few exceptions I wouldn't want to get shot by any of the rounds! One thing I have been trying to do is work on smaller groups - aim small, miss small. What I try to do is fold the silhouette target in thirds vertically. It works. One of my many guns I have is a 1954 Colt Commercial Government Model; here are two recent targets. 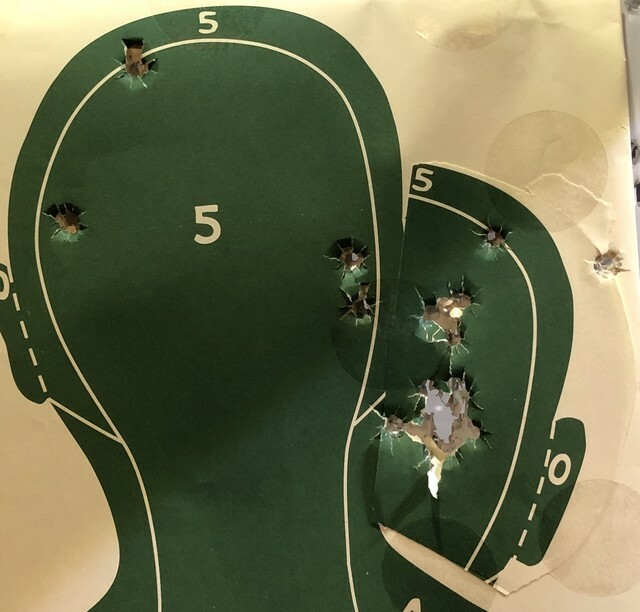 The first is 30 rounds shot using the CBP Qualification Course of fire - 6 rounds strong hand and 6 rounds support hand (only one hand) at 3-1/2 yards; 2 rounds center mass X 3 at the 7 yard line (6 rounds) the 2 rounds center mass and 1 round head twice at 7 yards; finally at the 15 yard line - 2 rounds strong side barricade standing, 2 rounds support side barricade standing, and 2 rounds either side barricade kneeling. 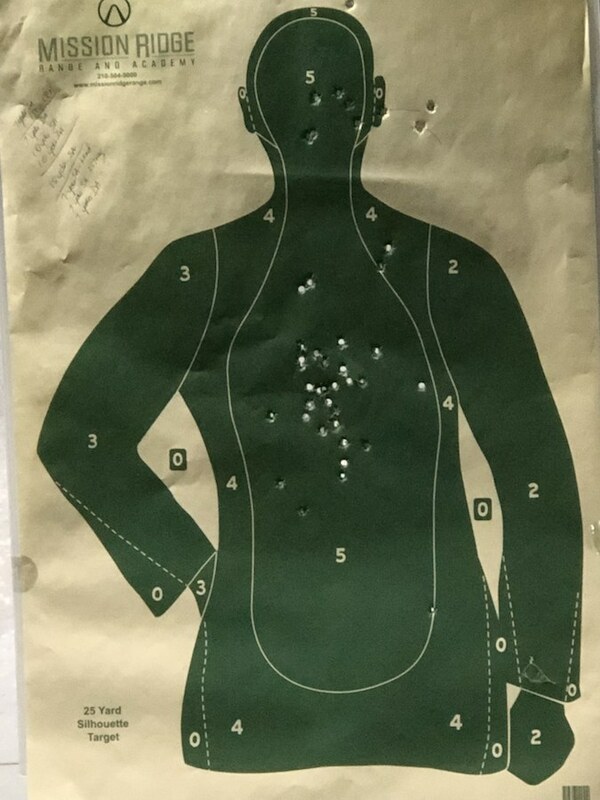 Because of the physical issues I have with my knees and back - I don't kneel on the last stages; I did when I shot the quarterly qual course when I was a CBP Officer - not pretty but I didn't take the easy way out that the Range Officers offered! One drill we shot on an outdoor bay started with 15 pushups, run 10 yards, and shoot 10 rounds. It wasn't pretty standing back up but I went first. Hey if I could do it - anyone else shouldn't have any excuses for not doing it! This target was the first time I tried something a little different - taping the head of another target on the shoulder of another; to simulate a hostage situation. 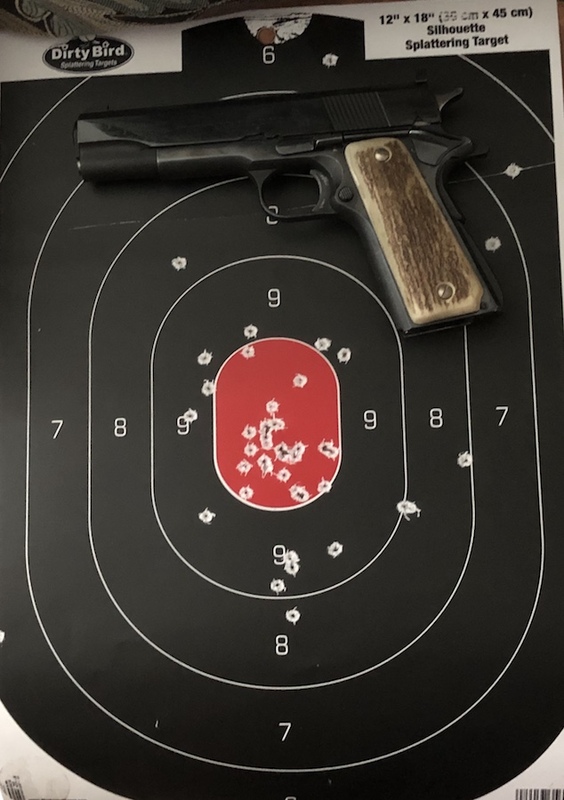 I was shooting my Dan Wesson Pointman-9; a full-sized 9mm 1911. The hostage was safe until I went out to the 25 yard line...I would imagine that in a hostage situation that for longer then 15-20 yard shooting situations a scoped long rifle would be used - but then I may be wrong too! Good shooting! I like the "Hostage" target, going to have to try that. Well Chief, it looks like it was a great day at a nice range. I was pleased to see how well the Enforcer shot for you. I remember you posting on finding it and one shortly later feel into my lap. I think I only shot it once at steel at ten yards. If I remember well it hit all the steel. I hope to have some work done on my hands here soon. I have one more visit with the Doc and a question or two. If that works out I hope to be back to shooting soon. Well Chief, it looks like it was a great day at a nice range. I was pleased to see how well the Enforcer shot for you. I remember you posting on finding it and one shortly later feel into my lap. I think I only shot it once at steel at ten yards. If I remember. I hope to have some work done on my hands here soon. I have one more visit with the Doc and a question or two. If that works out I hope to be back to shooting soon. I can relate to the "having some work done" - I have an appointment on the 30th of March with a Neurosurgeon about implanting a spinal cord stimulator implant. Although it doesn't actually fix the spine issues it blocks the pain signal from the nerve to the brain. I meant a little work to my hands. I know what you are speaking of from a friend who had the same type work done. To me that rates more than a little work. I hope your appointment goes well and everything works out for the best.